Here's Jumin! 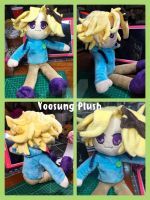 In chibi plush form x) He was the third route I played and is one of my favourites (Yoosung being the other one x)). I only wished they'd included more spoilers and had "Unknown" make more of an appearance. Anyway! This guy was super fun to plush! For some reason, even though there were a LOT of hair pieces to sew, I preferred sewing his hair to Zen's. I've already fully cleared the game several months ago, but I decided to replay Jumin's route while plushing him ^___^ to enrich my plushing experience hahaha. I was afraid all his little details wouldn't show up very well (since they are all black!) so I gave him lots and lots and lots of layers! He was quite a lot of work, but well worth it. I think he looks even more impressive in real life. 707's next!!!! ^^ He should be a nice change from Jumin/Zen's "muted" colours. After Seven, I'm also probably going to plush "Unknown" (planning to airbrush gradients in his hair!). I've been asked to plush Jaehee and V too, and I may plush them in the future or if someone commissions them. After "Unknown", I want to move onto characters from another Cheritz game - Dandelion. But I have mentioned I'd be opening some commisison slots after all the RFA boys, so maybe I'll open some while working on Dandelion? I'm not sure what the demand will be like though, and I will have very limited number of spots... so if I get a lot of requests, I might have to do a draw system or something? And I don't want to restrict myself to plushing only Mystic Messenger characters either. Anyway! Lots to think through, including pricing. 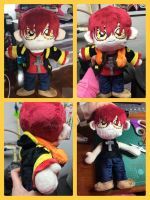 These dolls take a lot of time and work, so they'll be at least $150-180USD, depending on the character complexity.... just heads up in case you're wondering. you did an amazing job fitting in all of jumins details * 0 * he looks really cuddly! T_T can I legally marry a plush toy? this is so accurate! i give respects to the details and hard work put into this! Jumin! You make these look so cute! eyyy, its the cat lover!! man, now we are stuck in a deep conversation about mystic messenger XD I am so sorry I dragged you into this!